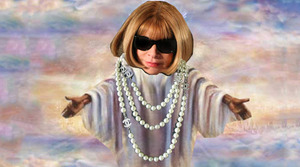 (NEW YORK) Anna Wintour, editor-in-chief at Vogue and editorial director at Teen Vogue, has been named artistic director at Conde Nast as well. Aya Kanai, formerly head stylist at Shopbop, has been named fashion director at Cosmopolitan. Danielle Mattoon, formerly travel editor at The New York Times, has been named culture editor at the publication. Fiona Dallanegra, formerly luxury brand consultant, has been named publisher of i-D.
Fabio Mancone, formerly director of communication and licensing at Giorgio Armani, has been named communication and image strategy adviser at the company. Anoushka Borghesi, formerly head of global PR at Giorgio Armani, has been named director of global PR at the company. Yannick Angelloz-Nicoud, formerly PR director at Giorgio Armani, has left the company. Melissa Brecher, formerly associate publisher, marketing at Lucky, has been named chief marketing officer at Fairchild Fashion Media. Rob Caldwell, formerly PR director at Badgley Mischka, has been named director of VIP relations at David Yurman. Mark Recker, formerly men’s PR manager at Tommy Hilfiger, has been named men’s PR manager at Prada. Geri Moran, formerly TK advertising sales at Vogue, has been named TK at Akris. Amna Kazmi, formerly TK [Esprit], has been named TK at Akris. Samantha Lefkowitz, formerly senior account director at D’Orazio & Associates, has been named vice president of fashion and accessories at BrandLink Communications, Los Angeles. Jasmine Stanley, formerly intern at BrandLink Communications, Los Angeles has been named coordinator at the company. Taylor Anderson, formerly account executive for consumer goods and lifestyle at BrandLink Communications, has been promoted to senior account executive at the company. Ashton Yoon, formerly PR assistant at Karla Otto, has been named PR executive at Heather Magidsohn Consulting. James LaLonde, formerly creative/marketing & public relations consultant, has been named junior publicist at Maguire Steele. Darlene Valencia, formerly account coordinator at Attack Marketing, joins Kravetz PR as West Coast PR assistant. Elise Edwards, formerly freelance TV and print journalist, joins Kravetz PR as broadcast consultant. Molly Hainline, formerly senior account executive at The Bromley Group, has left the company. Alison Brod PR announces its representation of Burger King, Ippolita, and the New York Baby Show. Maguire Steele announces its representation of Yael Sonia fine jewelry. BrandLink Communications announces its representation of Ramy Brook, Monika Chiang for celebrity services and media outreach, and C. Wonder for celebrity services and media outreach. REVELE INC. announces representation of Grace Lazenby’s Rockin Models workout. Mehta Media Group announces the representation of Martone Cycling Co.
Williamson PR & Showroom announces its representation of Novemb3r. EFG :: Entertainment Fusion Group announces its representation of Masonharlie Jewelry and Nicolino. Kravetz PR announces its representation of Steve Madden, Ltd., Report Signature, and Report Footwear. The Collective announces its representation of D’Lashes by Dionne Phillips. Lawlor Media Group announces its representation of Ivy Restaurant & Grill, singer/songwriter & peace advocate Liel Kolet, parenting & relationship expert Dr. Karyn Gordon, and JBFCS (The Jewish Board of Family and Children’s Services). HAAN PROJECTS announces its representation of Vika Gazinskaya. Linda Gaunt Communications announces its representation of Sachin + Babi. Fingerprint Communications announces its representation of CEO of TW Steel Group B.V., Jordy Cobelens, and Steel Entertainment Group, a leading artist management and events organization. Michele Marie PR announces its representation of Pale Cloud. VPR announces its representation of LaPina by David Helwani.